CLEAN THE WINDSHIELD THROUGHLY AND QUICKLY. Seven Sparta windshield cleaner is exactly designed for vehicle cleaning and reducing the fatigue of past cleaning, it can be used to clean all positions inside and outside the car glass, especially the gap between the windshield and the dash board, where is inconvenient to clean. This is suitable for most cars, even kitchens, bathrooms, furniture, etc. EXTENDABLE OF 9.3-15.4 INCHE ERGONOMIC HANDLE. 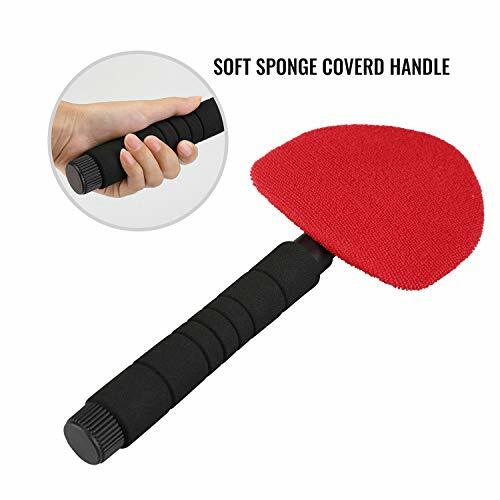 The handle of our cleaner not only contains the soft sponge cover to ensure your comfort when cleaning the window, but the adjustable length of the handle also makes it easier to clean the vehicle glass. 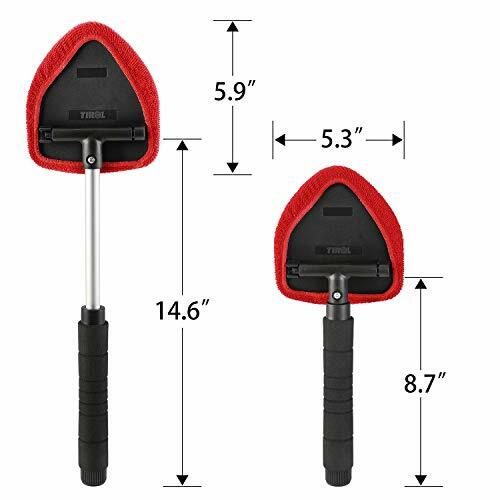 The handle is 9.3-15.4 inch and whole cleaner is 13.2-19.3 inch, which is long enough to allow you to clean any position of the car glass. Just rotate the handle clockwise to adjust the length, and tighten the handle by turning it counterclockwise. 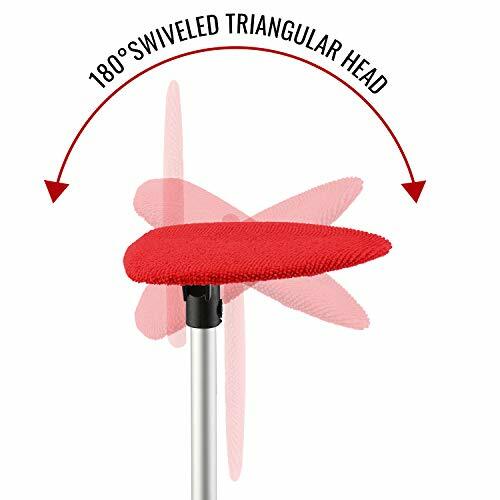 180°SWIVELED TRIANGULAR HEAD. 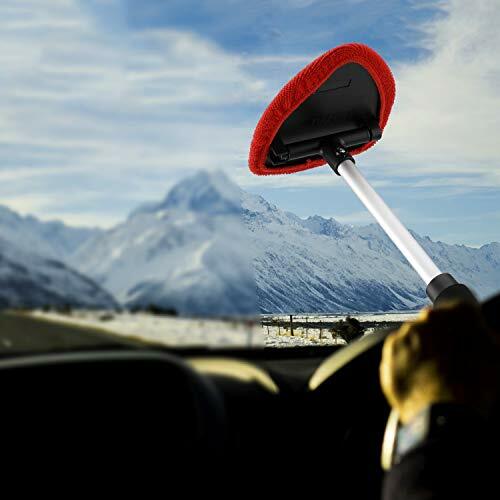 Designed with pivoting triangular head to make a complete contact to the glass, which can be rotated 180 degrees to fit the glass surface very well, The flat surface of the head pad also balances the pressure, the perfect combination of the two solves the problem that you can't clean the vehicle thoroughly during the cleaning process. CONSIDERABLE PACKAGE. Came with two pieces of removable and reusable fiber towels for easy replacement. 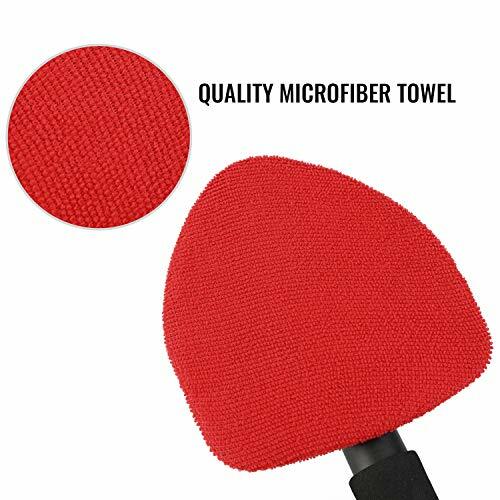 The towel is made of soft microfiber and the surface of the fabric is finely treated , which must clean your vehicle well and never cause streaking after cleaning. NO-RISK PURCHASE! UNCONDITIONAL 30-DAY MONEY-BACK GUARANTEE. If you’re unsatisfied with this item for any reason, we’ll immediately refund your purchase price. I love this window cleaner. It comes with an extra cloth so when one gets dirty, you can put the other one on for easy switch out for cleaning. I keep the spare in my glove box. I found this cleaner has been very helpful when it’s cold outside and the heat is constantly blowing on my windshield giving it a dirty film. I love this! 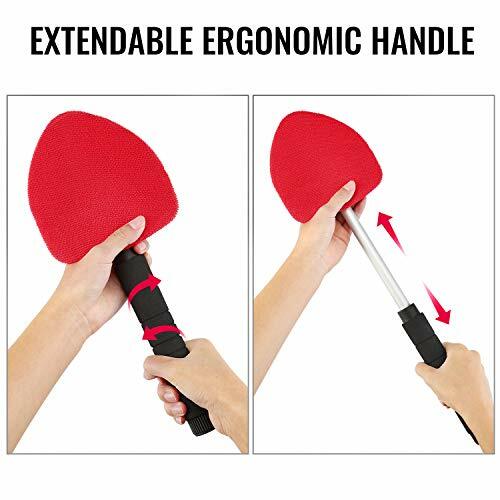 Very nice item arrived, has a foam grip, red lint free cloth (2 of them) the handle is adjustable for the perfect setting. I used it on my SUV and truck, it worked perfectly on both. Gives you the added length to your reach when cleaning the windshield (or any of the windows for that matter). I would recommend this to family and friends. I like it. It's handy and well made. Love this product, I am short so sometime my hand can't reach to wipe the whole window. When is at night and you see the dust or fog cover the window is very hard to wipe the whole area. The product is perfect, you can extend it so it can also reach to the passenger side window and al the corner of the window also. Definitely recommend this product. The product delivered looks just like the one in the picture and it was very comfortable to use! This helps clean the windshield way better than trying to do it by hand.I have to say this thing is super soft and flexible. All in all, I am happy with this product. Slightly longer handle would have been better. Definitely a useful buy. This device makes it much easier to clean my windshield. I always would miss the middle of it because i could not reach it but with this i can easily clean the whole thing with ease. This makes it easy to clean the inside of your windshield. Greasy streaks that make it especially hard to see on rainy nights are easily wiped clean with this! I always had trouble cleaning the windshield from inside but this solves it!! My dad needs this for his car so i got it for him. Nice quality and exactly what he is looking for. I love this little windshield brush! The way my car's windshield is, it's extremely difficult to clean it effectively without leaving streaks. With this brush and the way it moves and extends, it makes it 100 times easier and cleans it very nicely! So convenient and storable! The cleaner works very well. It makes my car very clean and I can see without any problem. 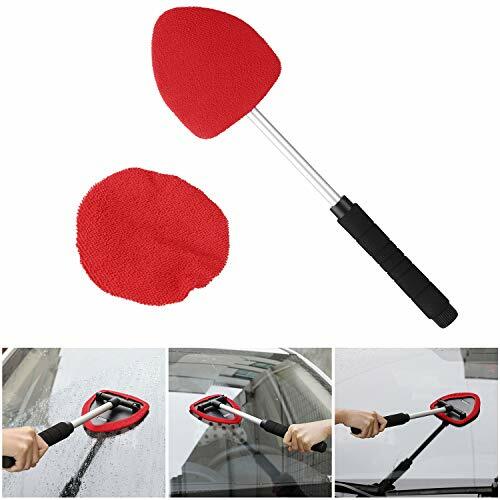 very good product, it makes cleaning inside mirror and windows much easier. Easy to use. Just couple moves and glass is clean and clear. It was nightmare to do it without this smart invention. Thank you. I love this. It is compact and stows easily. Works great on the inside of the windshield to remove that smokey haze buildup. This is very lightweight and handy. Can easily clean glasses and also remove snow(small amount).